Ascot couldn’t have come round quick enough this year. The sun is shining, the grass is green and the hat stands are empty. 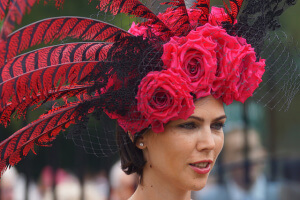 However for this years’ race-goers, the rules of the Ascot dress code are stricter than ever and as the doors swung open on Tuesday, the masses of fashionistas and trendsetters flooded in, as did this year’s fashion faux pas’. With the ban on the fascinator introduced this year, more attendees than ever were looking to get themselves hat-papped and once again there has been some paparazzi-worthy headgear! Milliners up and down the country have taken full advantage of this prestigious occasion and the array of wildlife that has been fashioned into hats so far is more impressive than ever. From birds to flowers and oversized hats to small ones (although definitely no smaller than 10cm! ), as always the most important part of any ladies outfit in the royal enclosure has remained perched on top of their heads. However, for one guest, heads weren’t turning to look at her hat but to gasp at her outrageous dress and very obvious PR stunt! All eyes were on Strictly Come Dancing star, Kristina Rhianoff, as she arrived at today’s races including that of the Royal Ascot fashion police and security. Ignoring the well documented Ascot guidelines, Kristina was dressed in a short 1920’s style flapper dress made out of Coral betting slips. The Ben de-Lisi designed dress broke Ascot’s strict guidelines in more ways than one. Spaghetti straps and above the knee skirts have always been a strict no-no when it comes to Ascot etiquette, let alone the dress being emblazoned with the name of a famous betting shop. If this was a PR stunt, it was nothing but a success as within just a matter of hours photos of Kristina in THAT dress have already featured across numerous newspaper websites and I am sure there will be plenty more to come when tomorrows papers hit the newsstands.